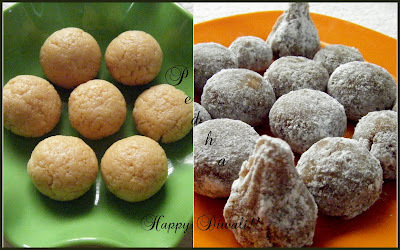 Easycooking: Pedha,not one but two ~ Diwali Mithai!! One main reason we disliked pedhas was because they were sweet-cloyingly sweet.Then why a post of pedha you may think,that too two types.Well,I do cook exclusively for the blog sometimes:). I am totally hooked to Hetal & Anuja’s Show me the Curry.Saw this simple recipe for Instant Pedhas and thought of trying it out after all.Having all the ingredients in my kitchen was a bonus.I halved the recipe and got a dozen pedhas.For some unknown reason,the pedhas have come out sort of crumbly.I struggled to shape them.Me and Ajay shared a piece and have to admit that they taste awesome.I tried out Wheat Pedhas from Home Spices too for an almost guilt-free indulgence. In a microwave safe dish, melt the butter. Once the mixture has cooled down, grease your hands and make balls. Gently press the balls and flatten them to shape…round and flat. Decorate them with colored sugar, almonds, cashews, pistachios or raisins. Let the pedas set and cool down. For a pretty presentation, place them in baking cups and serve. Powder some cardamom seeds and add to the mixture for additional flavor. Roll out the peda mixture and cut with cookie cutter for some fun shapes. For best results, store in the refrigerator but serve at room temperature. In a thick bottomed kadai add ghee and roast the flour for 3-4 minutes on low flame or until it starts smelling good. Now add the milk and continue stirring till it becomes one single mass and starts to leave the sides of the kadai. Grease a thali/plate with ghee and pour this mix into it and let it cool. When it is cool enough to handle,make small balls of it and flatten it a bit.Roll them in powdered sugar and store in airtight containers. Or better still indulge and share it with your ♥loved♥ ones. Wow pedha...my all time fav. So easy recipe..thanku for sharing this.. Perfect Diwali sweets. Looks so good. Nice recipe. YUM! will try the wheat peda..sounds good.. Both together looks amazing, prefect pedhas for diwali DIvya...Happy diwali wishes dear! Both the pedas look yum, so is your coconut laddoo. Hapy Diwali to you. Happy diwali to you too. Both recipes are just awesome. I think i will try the pedhas too. You are on a total Diwali sweet spree!! hey Happy Diwali...lovely recipes..as as usual the pics are BEAUTIFUL!! the wheat one really looks yum..looks like dharwad peda..isn't it? Blogosphere full with Diwali essence..i m just loving it, missing home..the first pedha, hv made twice.It surely tastes great..the second one I assumed was Kundapur brown pedha..till I read your post! :D Must try it out..sounds nearby Gold paapdi..tks for showcasing! :) Ur tried n tasted = Hit at my place! HAPPY DIWALI! Looks wonderful Divya! Happy Diwali to you and your family! Hope you had a great time. hi happy diwali and a prosperous new year . love all the sweet recipes ,will definitly make some .